Stop me if you’ve heard this one. How many Trump supporters does it take to change a light bulb? Answer: We don’t know, because they’re currently refusing to see the light. OK, so I’m clearly not a comedian. But that’s where you come in, America. Put your humor hats on, because we’re going to need the best farce, satire and parody this country has ever seen to stop the unstoppable Donald Trump. Simply put, we’ve tried everything else, and nothing works. We’ve tried stopping him with money. Last month, a super PAC launched a multimillion-dollar campaign of anti-Trump advertising. We’ve tried threats. Billionaire media mogul Barry Diller said he would either leave the country or “join the resistance” if Trump is elected. Cher tweeted that she would “move to Jupiter.” Alas, threats don’t seem to be working either. In our increasing desperation, we’ve even resorted to schoolyard taunts. So far, “a—hole” is the insult of choice for everyone from Julio Iglesias to Philadelphia Mayor Michael Nutter. But insulting Trump only makes him stronger. Simply put, our current strategy is not working. And besides, winning the argument doesn’t necessarily translate into defeating the Donald. Is Trump a racist? Judging by his various comments — yes. The problem is that we’ve had no problem electing racists in the past. 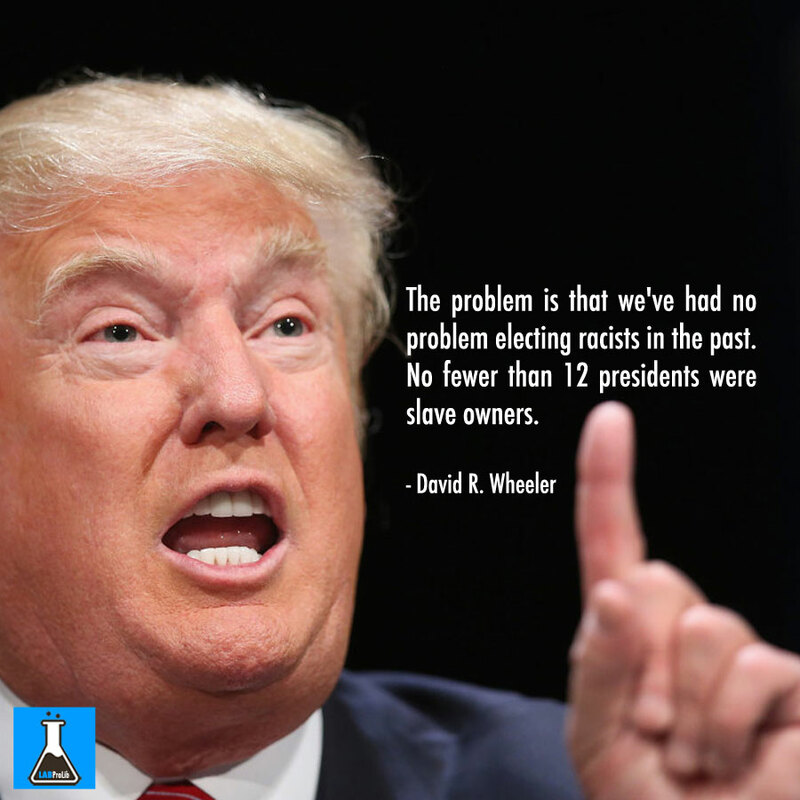 No fewer than 12 presidents were slave owners. Former President Woodrow Wilson, despite being remembered as a progressive liberal, was a segregationistwho passed legislation banning interracial marriage. Franklin D. Roosevelt locked up more than 100,000 innocent Japanese people during World War II. In later decades, both Lyndon Johnson and Richard Nixon were fond of using the “n” word. Being a racist doesn’t disqualify you from being president. But you know who doesn’t get elected president? A laughingstock. If you’re a joke, you don’t get voted into office. In 1988, Democratic nominee Michael Dukakis tried to bolster his pro-military image by riding in a battle tank for a photo op in Sterling Heights, Michigan. Comparisons to Snoopy ensued, and the country hasn’t stopped laughing 27 years later. In 1996, GOP candidate Bob Dole fell 3 feet off a stage during a campaign rally. The fall didn’t hurt the man, but the comic imagery helped destroy his fragile campaign. In 2004, when Democratic candidate Howard Dean emitted an impassioned battle cry on camera, he inspired one of the most merciless Internet memes of the early 21st century: The “I Have a Scream” speech. Losing the Iowa caucuses was the least of his problems; he had become a punchline. The comb-over jokes about Trump are pretty good, but we need to pump up the parody. Luckily, Trump provides a nonstop stream of absurdities to make fun of. Consequently, there will never be a shortage of Trump material. Author J.K. Rowling has the right idea. When Trump was compared to Harry Potter villain Voldemort, Rowling noted that this comparison was insulting — to Voldemort. Meanwhile, Andy Borowitz’s satirical headlines at The New Yorker are doing more damage to Trump than the angriest tirade could ever achieve. “Trump supporters disappointed he only wants to ban one religion,” says one zinger. Please, America, keep the jokes coming. Make us laugh at Trump. Not only is comedy our most effective weapon against him, but it’s also the only thing that will keep us from sobbing uncontrollably.